It was a difficult decision to be in Hue for New Years the city was much bigger than we had originally thought but still there weren’t any fireworks or bands playing in an outside venue. The local Vietnamese all gather with their family and friends in a park fenced off on a lawned area along the Perfume River however not knowing any locals we decided to do something a little touristy but we are so glad we did as we decided to have a feast for a king. Have you ever wondered what you were eating was safe and did it come from a reputable stall. 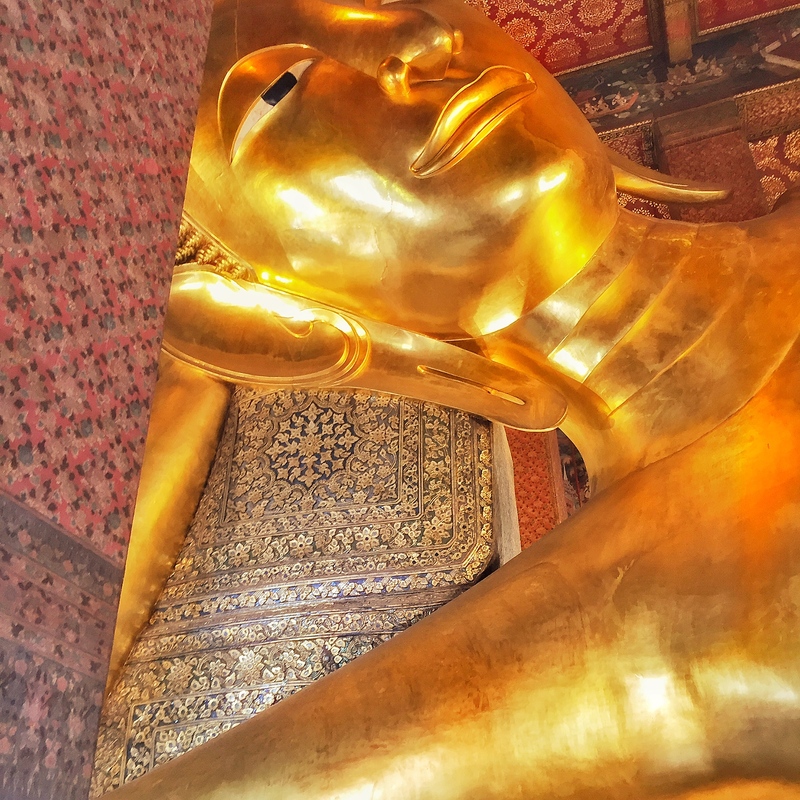 You may sometimes think that especially the first time you travel through Asia. Street food is cheap, often tastes better than what you eat at a restaurant and most times safe. Some things that you should look for is if the product is fresh, you want to eat something that hasn’t been sitting. You want to see it being made,make sure it’s hot. Locals don’t want to be sick either,so if the locals are lining up for it then you know that the food should be good and hygienic. Singapore is generally known for its cleanliness and also known for its amazing array of food from Chinese, Malay, Indian and the Middle East. Singapore is a great country to be introduced to street food especially for people who may be a bit apprehensive at first. Unlike other countries Singapore food hawkers are all given a grade of A, B,C or D. These grades are issued by a Singaporean Ministry of Health official. The hawkers in Singapore are required to display their signs for cleanliness”C” is average and “D” below average.”A” is exceptional cleanliness. Currently the majority of more than 5,600 stall holders in food centers are rated A and B, only seven are grade D and fourteen percent C.
Most travelers will choose to eat at either A or B but Singaporeans have no problems with eating at Hawkers with a C grade as often these stands are run by a single person who has to cook, serve, collect payment, giving them little time to clean but of course the food will still have to taste good. 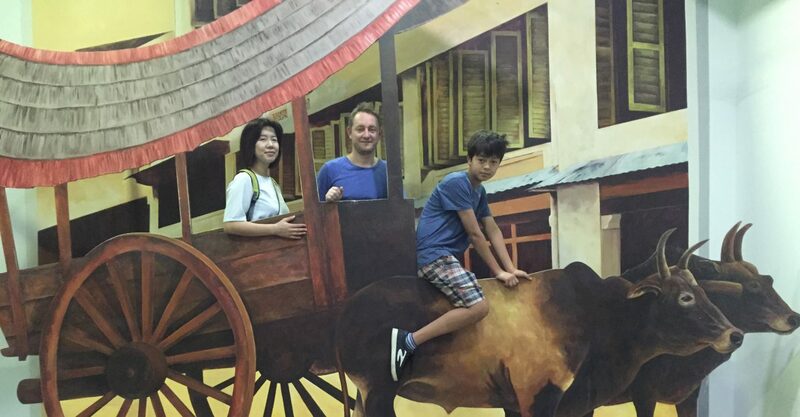 During our five day stay in Singapore we ate most of our meals from a hawker centre.At first it may be a little intimidating but basically you choose which stall you want to order from and grab a seat at any of the vacant tables. If you see something on a table like paper, a packet of tissues that means someone as reserved that seat so it would be better to look for a different table. If you cannot find a vacant table you can always approach a table that has someone sitting there but don’t forget your manners,smile and ask before sitting. Now the hardest thing is deciding on what to order and here we will help you with 5 of our favourite hawker food. 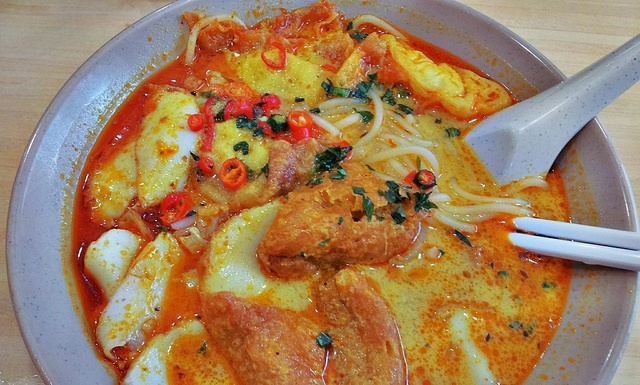 Laksa which would be close to Singapore’s national dish is found at any hawker stall. Its long, thick noodles covered in a coconut flavoured curry soup with either chicken or prawns mixed with bean sprouts make the perfect condiments to go along with the broth. 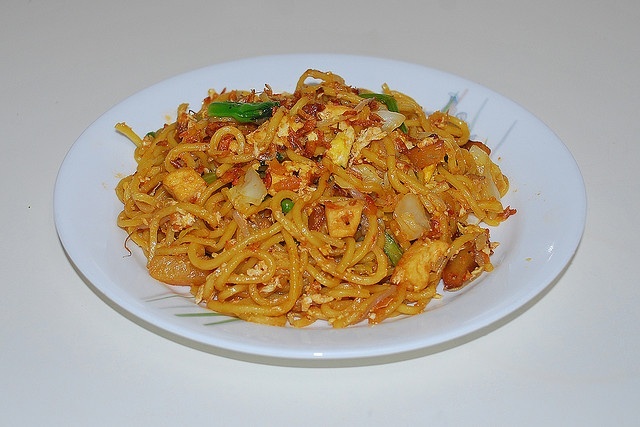 Mee Goreng which means “fried noodles ” is a common dish in Indonesia, Malaysia and Singapore. It is made with thin yellow noodles fried in cooking oil with garlic, onion with prawn, chicken or beef sliced bakso (meatballs), chili, Chinese cabbage,cabbage, tomatoes, egg and acar (pickles). If Laksa isn’t Singapore’s national dish then it would have to be chicken rice. 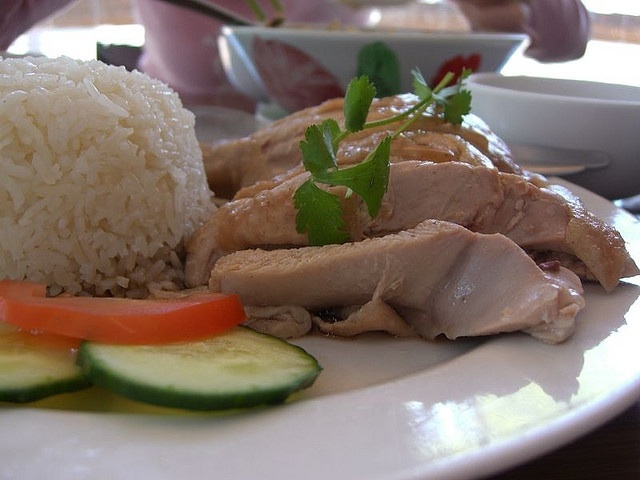 Steamed chicken is served with a bed of rice cooked in chicken stock. 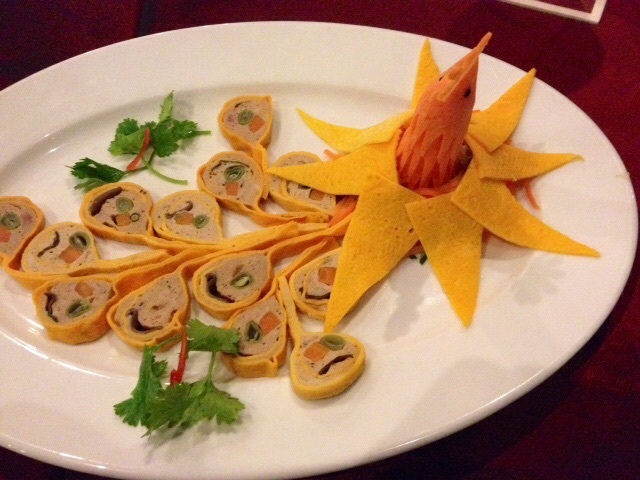 This is normally eaten with chilli sauce, soy sauce and a ginger paste. This was our favourite meal. The chicken is very tender and we loved the slight ginger flavour. This may not be food but this was the most refreshing drink that I had while in Singapore. 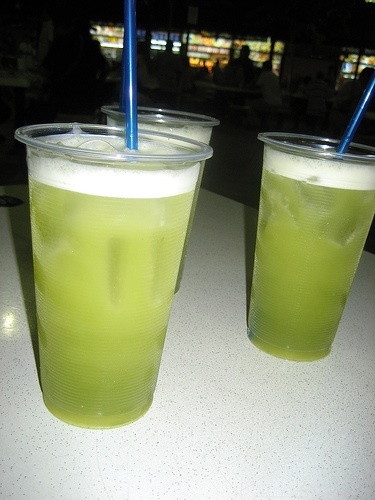 The juice is extracted from Sugar cane coming out a sweet green liquid. The drink is not uniquely Singaporean as it can easily be found in other countries in Asia as well as South and Central America but if you haven’t tried it then you should while your here.